You may have noticed that the game is a bit slow, and it bogs down some. Turns take a really long time, and if you are playing with 6 people you might be in for a seriously long night. For guys that’s cool, but if you have some gals along for the ride (including wives), maybe you will really appreciate the house rules we play with on a regular basis. I give props to Kirby Thompson for most of these rule modifications. #1. 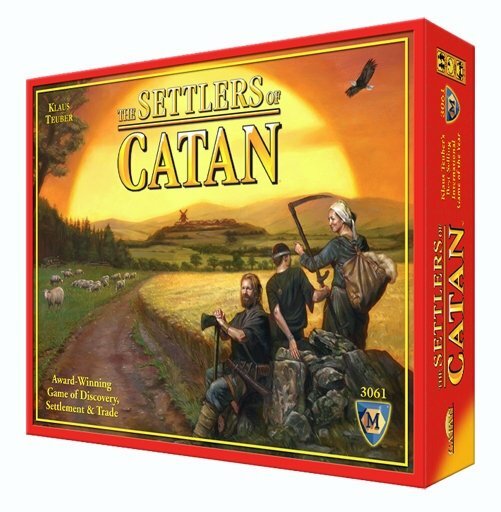 In normal C&K you get a 1 commodity & 1 resource when a city produces – new rule: take the 2 resources you’d get for a city in regular Catan and ALSO take the 1 commodity when your city produces. (YESSSSSS! This is amazing. The first time you do it you’ll think we’re crazy, but trust me, when you all can build faster and progress early in the game you’ll be super stoked.) This means that when wheat and brick produce, you get 3 of those (since there is no associated commodity). To be clear, if you hypothetically had a city on all 3 corners of a hex that produced you would gain 9 total cards in one shot. #1. Play with the Harbormaster card from the Traders & Barbarians expansion and you will add more ways to win – make sure you add that extra point required for victory though (i.e. victory is now achieved at 16 points). #2. Set up your own scenario: this is optional but very, very fun and how we play almost every time now. We build crazy big boards. 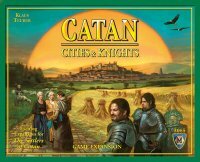 A suggestion if you want to try the multi-expansion thing is to do “Through the Desert” scenario as set up in the 5-6 Seafarers expansion and combine with C&K. That one is particularly awesome in the radical combo action. Bonus comment: Don’t let anyone get away with not following the rule that longest trade route must have ships and roads linked by a settlement (or city). This is important and has thwarted many a possible win. Now if you think these rules somehow cheapen the game, all I’ll say is try it. I’ve heard people say that C&K is a bad expansion but that may only be because they don’t play with these house rules. We played regular rules C&K several times before we discovered these modifications, and while the game was quite intense, it wasn’t as good of a social game anymore. That said, do these house rules, combine with Seafarers, play with 5 people, and trust me, it’s extremely cutthroat. The game still averages 90 minutes but we have had game as short as an hour, and just 2 days ago we had a game last 2 1/2 hours. 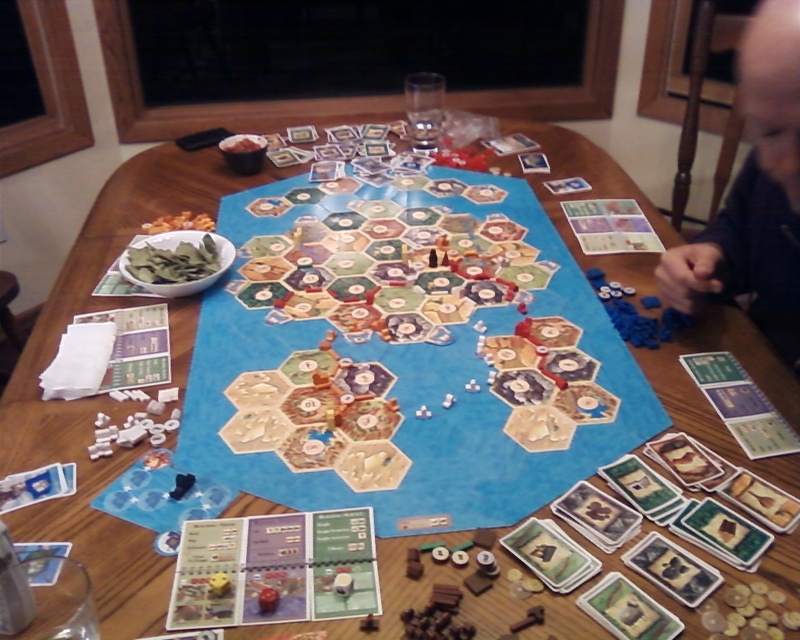 To be fair, we had added in the rivers expansion as well as Seafarers and C&K. See pic below, snapped just as we were tearing down the game.